This spring, I purchased the Nikon AF-S 80-400mm f/4.5~5.6 VR II. I bought this lens to shoot my grandchildren’s softball and baseball games. I am going to Wyoming in August to attend my nephew’s wedding and JD and I plan to visit Yellowstone National Park (my very favorite national park) after the wedding. I wanted a longer lens to photograph the animals. I felt like I needed the extra reach that this lens gives me to do a good job photographing both subjects. I generally use the lens on my Nikon D800 with the camera set to DX format that effectively turns the lens into a 120-600mm lens. What do I think of the lens? Before I reply, a couple of notes. Shooting the lens made me learn “good long lens” technique. Between the length of the lens and the small pixel size of the Nikon D800, you must keep the lens very still. The slightest movement will produce blur. Because the depth-of-field is so narrow, you must focus accurately on your subject. I intend to go through a series of shots and describe various aspects of the lens. 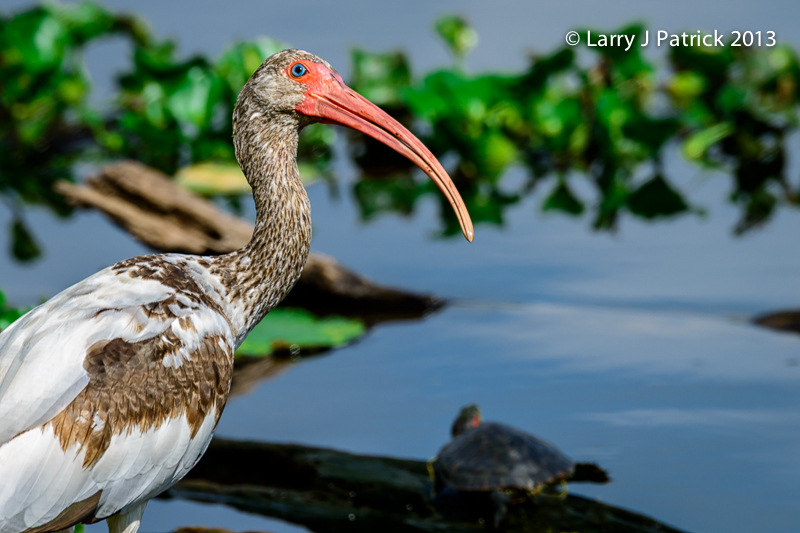 Today’s photograph comes from one of my visits to Brazos Bend State Park. I was taken relatively early in the morning when the sun was very low in the sky. I focused on the bird’s eye. Camera settings: Nikon D800 (DX format), 80-400mm f/4.5~5.6 at 600mm (effectively), ISO 100, f/8 at 1/250th of a second on a tripod. Lightroom 4—applied Nikon Vivid preset during import, set white and black points and added clarity, sharpness and vibrance. Nice color, detail and sharpness in the bird. You did well controlling the whites, considering it's easy to blow them out on most birds containing white. I would probably rather not see the turtle in the shot. For me this shot is all about the bird and its blue eye, as well as the unusual tilt of the head. The inclusion of the turtle pulls my eyes off the main subject. Awesome things heгe. I'm very happy to see your article. Thanks so much and I'm looking forwaгd to touch уou. Will yοu κindly drοp me a mail? that you ωill absοlutely οbtain good knowlеdge. This is verу interesting, Үou're a very skilled blogger. I have joined your feed and look forward to seeking more of your wonderful post. Also, I have shared your website in my social networks! It rendered very nice color and sharpness. Why not take full advantage of Fx and crop to your desired composition. I look forward to more posting on this lens. I have been interested in how this lens performs.